Original Editors - Kevin Schoenfeld from Bellarmine University's Pathophysiology of Complex Patient Problems project. A patient with Paget's disease will often present as asymptomatic. However, the clinical presentation of a symptomatic patient varies greatly, due to the different levels of severity of this condition. Warmth over the affected bone or joint. Loss of bowel or bladder control which may indicate spinal cord damage. People with Paget's disease are also more susceptible to fractures because Pagetic bone is weaker than normal bone. Cardiovascular problems may arise when 1/3 to 1/2 of the skeleton is involved, heart failure is possible due to an increased cardiac output (this is the most common cause of death in people with advanced Paget's disease). A rare complication is sarcoma which is a bone cancer (also known as osteosarcoma or osteogenic sarcoma). 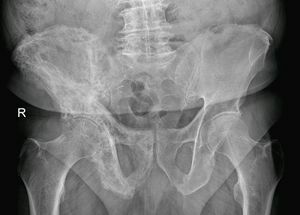 This cancer may develop in Pagetic bone, which occurs in less than 1 percent of people with Paget's disease and usually doesn't develop until many years after the onset. The exact cause of Paget's disease is unknown, though it is thought to be a slow, viral bone infection due to risk factors that include a gene-environment interaction. The prevalence and causes of Paget's disease has been associated with genetic and geographical factors. A positive family history is reported in as many as 40% of patients with Paget's disease . Paget's disease is mostly seen in an autosomal dominant distribution, and there have been three identifiable chromosomal regions associated with Paget's disease. Geographically, populations in European, British, and Australian origin, and a migratory influence also play an important role especially in countries which of the early population migrated from Britain (United States, Australia, New Zealand, Canada). Due to abnormal osteoclast activity, inhibition of bone resorption with bisphosphonates (ex. Zoledronic acid, Risedronate, Alendronate, Pamidronate, Etidronate Disodium) is the gold standard and first treatment initiated to decrease osteoclastic activity, improve bone density, and increase the strength of the bone itself. Bisphosphonates many times provide long-lasting remissions and treatment response is monitored through assessing the reduction of biomechanical markers such as the SAP levels. Patients should intake 1000-1500 mg of calcium and at least 400 U of vitamin D daily. This recommendation is especially important while utilizing bisphosphonate treatments. The goal of this treatment is to cause a full remission (normal SAP levels) and prevent complications of this condition. Patients who may not tolerate bisphosphonates can use Calcitonin, a natural hormone involved in calcium regulation and bone metabolism. Calcitonin is a drug that is administered by injection. Depending on the severity of pagetic changes and degree of pain, NSAIDS and other anti-inflammatories are used to control the pain. Some patients benefit from a combination of medications such as an analgesic and antidepressant. Modalities such transcutaneous electrical nerve stimulation (TENS), hydrotherapy, acupuncture, and physical therapy may also provide pain relief. Orthopedic assistive devices such as canes and shoe lifts may help some patients. Surgical intervention may be indicated if a patient is resistant to pharmacological or orthopedic interventions. A Joint replacement is indicated if severe degenerative joint breakdown is present. If a nerve compression syndrome is present and the patient is nonresponsive to conservative treatment, surgery is required. Other common surgeries for Paget's disease include occipital craniectomy to relieve basilar and nerve compression, and tibial osteotomy if the varus deformity is severe. Many of these conditions may co-exist with Paget's disease. ↑ 1.00 1.01 1.02 1.03 1.04 1.05 1.06 1.07 1.08 1.09 1.10 1.11 1.12 1.13 1.14 1.15 1.16 1.17 1.18 1.19 1.20 1.21 Goodman C, Fuller K. Pathology: Implications for the Physical Therapist. 3rd ed. St. Louis, Missouri: Saunders Elsevier;2009. ↑ 2.00 2.01 2.02 2.03 2.04 2.05 2.06 2.07 2.08 2.09 2.10 2.11 2.12 2.13 2.14 2.15 2.16 2.17 2.18 Josse R, Hanley D, Kendler D, Marie LG, Adachi J, Brown J. "Diagnosis and Treatment of Paget's Disease of the Bone".Clin Invest Med. 2007; E210-E223. ↑ 4.0 4.1 4.2 4.3 4.4 4.5 4.6 4.7 4.8 Goodman C, Snyder T. Differential Diagnosis for Physical Therapists: Screening for Referral. 6th ed. St. Louis, Missouri: Saunders Elsevier, 2007. ↑ 6.0 6.1 6.2 6.3 6.4 6.5 Chow, David. Emedicine. Med Web:Paget Disease. http://emedicine.medscape.com/article/311688-overview. Updated December 18,2008. Accessed April 2, 2010. ↑ Hadjipavlou, Alexander G, Gaitanis, Ioannis N. “Paget’s Disease of Bone and its Management”. The Journal of Bone and Joint Surgery. March 2002: 84B. No.2. ↑ Medical Foundation for Medical Education and Research. Mayo Clinic: Paget’s disease of bone.http://www.mayoclinic.com/health/pagets-disease-of-bone/DS00485. Updated August 15, 2008. Accessed March 3, 2010. ↑ 9.0 9.1 Seton, Margaret. “Diagnosis, Complications and Treatment of Paget’s disease of bone”. Aging Health. ↑ 10.0 10.1 Roux, Christian, Dougados, Maxime. “Treatment of Patients with Paget’s Disease of Bone”. Disease Management. November 1999: 58 (5):823-830.